In order to generate revenue for your app with Banner Mediation, you will have to integrate the ad unit in your code, integrate your preferred ad network adapters and activate the Banner Ad Unit. To set up Banners, you’ll need to add your app to the platform. Follow this guide for instructions on how to set up your app. It is important that you make sure to switch off the banner refresh rate on your mediated ad networks. With ironSource Ad Placements, you can customize and optimize the ad experience in your app. This tool enables you to present banners to your users from different placements and customize the ad frequency. In the Placements section, you will see a DefaultBanner placement that you can edit and add capping and pacing settings for. In addition, you can add a placement by clicking ‘+ Add Placement‘. Next, select the Placement Name from the list or enter a custom name and click ‘Save‘. 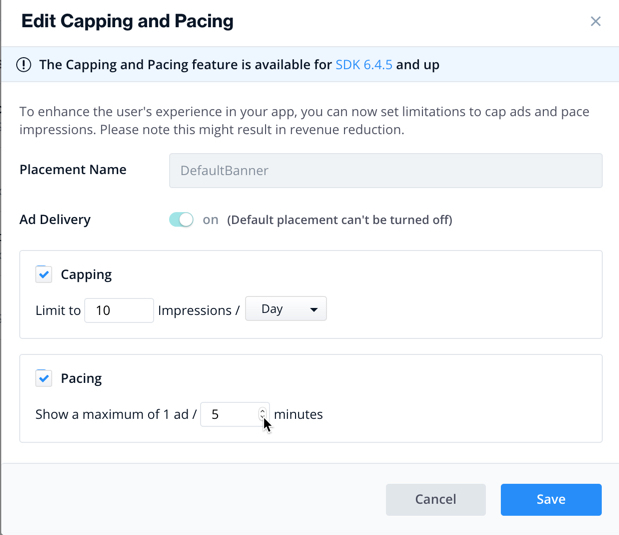 Then configure Placement Capping and Pacing to enhance the user experience in your app. Placement Capping will limit the amount of ads your serve for the selected placement. You can set limitations by day or hour. As seen below, if you limit this placement to 15 impressions/day- you will only serve 15 ads for this placement per day. 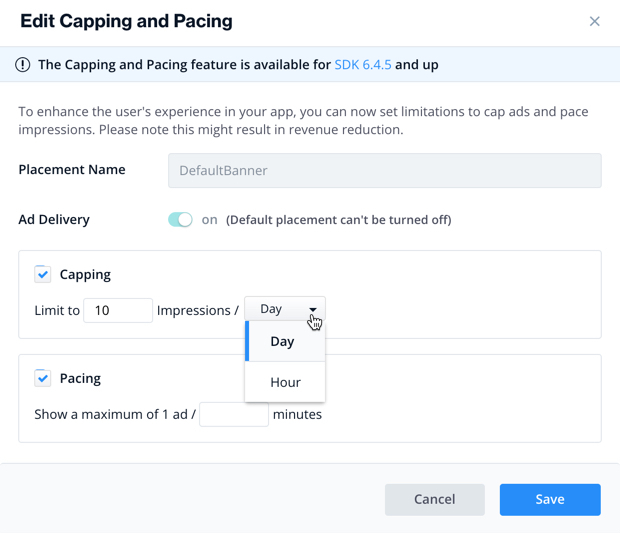 Placement Pacing offers you control over the time interval between ads for the selected placement. For example, if you have an ad placement at app launch and a user opens your app, he will see an ad for this placement. If s/he then navigates out of the app and back within 3 minutes, he will not see an ad at app launch. You can’t switch off the ad delivery for the default placement. Capping and pacing your ads might result in revenue reduction. 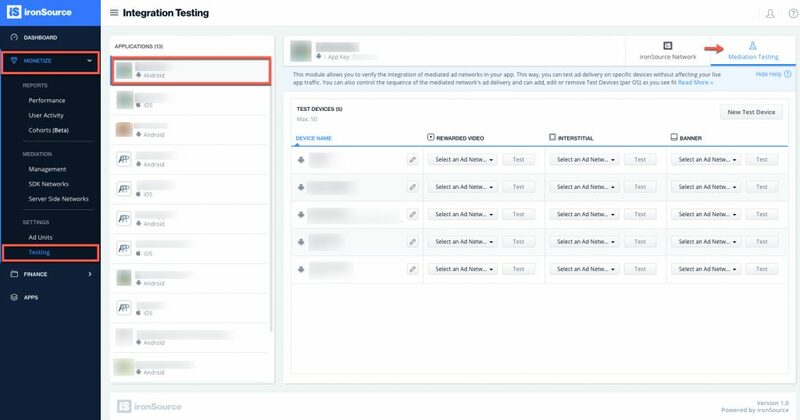 Next, make sure to set up your selected ad network on the Network Setup page and set it to active. 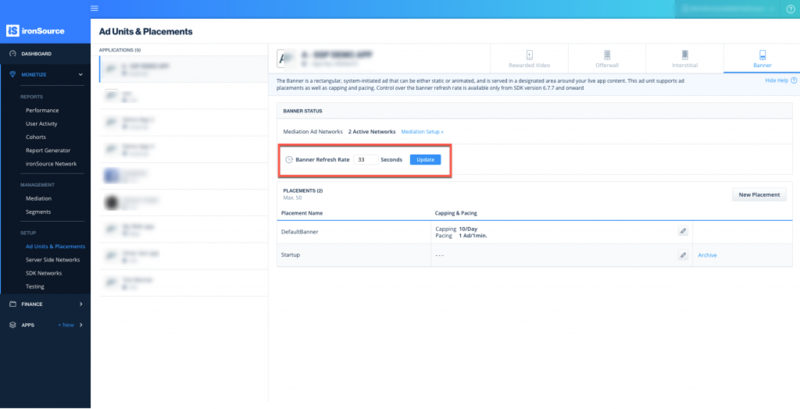 To ensure your Banner Mediation integration was successful, activate the ad delivery on the dashboard of your network partner as well as on the ironSource Network Setup page. Note: This will activate live Banners on your app! then you will be able to select the ad network from the Banner column, click on Test and you will receive live ads to your test device. To receive the revenue the ad unit generates, you must provide Company and Payment information. Your app can now receives live Banner ads.